I’m just going to say it, Deewar is the best written film in the history of Hindi cinema. It deserves an epic detailed perfect discussion. That is not this post. This post is a very superficial and not detailed discussion as it relates to the upcoming release of Raees. Disclaimer: This post assumes you have already seen Deewar and watched every promo for Raees and therefore are ready to consider the larger ways in which the two may be related. Do not read if you have not seen Deewar!!!! And do not read if you want to be surprised by what happens in Raees!!!! First, a story: I have only met one Desi in my life who has not seen Sholay. When this came up, my reaction was of course “YOU HAVEN’T SEEN SHOLAY??????? ?” Apparently this was the first time he considered this as strange, so then he started thinking about it, and eventually traced it back. You see, his family didn’t really watch Hindi films. Although his parents had when they were young. And there was one Hindi movie that they did watch over and over. And finally he realized what happened after putting together all the family stories. His mother in 1973 went to see Deewar in theaters and never felt the need to watch another Hindi movie after that. Because there was no point in any other film after you’ve seen Deewar. Better to just re-watch it for the rest of your life. Sholay is the “perfect” movie, visuals and pacing and comedy mixed with love story and all of that is just the best in every way. But Deewar is Sholay with all the fancy trimmings removed, the speed racer to Sholay‘s Rolls Royce, as it were (does that metaphor make sense? I don’t know cars). Deewar is just the story, and that’s it. The story, and Amitabh. 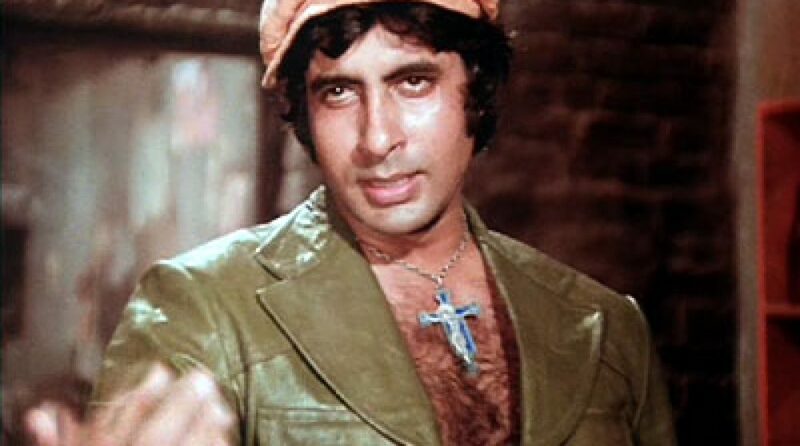 Deewar is probably Amitabh’s greatest role. No one else in the world could have played that part. Not just played it, embodied it. Amitabh isn’t just acting here, he is becoming this character, with all the force and power and anger and everything else inside of it. Amitabh is what gives meaning to Deewar, how he is and what he is and how he plays the role. Deewar is like Shakespeare, the meaning of each line and every scene can shift depending on how it is said and how it is played. And because if is Amitabh saying it and (a little bit) because of how Yashji chose to direct, there is a different meaning to Deewar than what we see in the bare outlines of the plot. If you were on the censor board, you would look at Deewar and see the story of a “good” and “bad” brother. The “good” brother triumphs, along with his virginal bride and his saintly mother. The “bad” brother ends up redeemed in death. Nice, tidy, nothing controversial or alarming. But if you are in the audience for Deewar, released during The Emergency (Indira Gandhi’s 21 month period of suspension of civil liberties. Which of course the audience didn’t know would only be 21 months at the time), after decades of the “License Raj” which picked away at the common man’s ability to progress in society or find any small sense of happiness, after years of the wealthy buying their way out of any problem, moving to cities because your lands have dried up thanks to government Dams, or become toxic from factory waste overlooked by the officials who are supposed to protect you. Living on the streets while you try to build some kind of better future for your children: well, then, when Amitabh finally breaks loose and stops standing silently by enduring injustice and instead fights back for the first time, or when he tells a rich man “I will not pick money up off the ground”, or cries out in anger to God at the end, when the troubles of his life have finally driven him to the temple, “ARE YOU HAPPY NOW??? ?”, then the audience knew exactly what Salim-Javed was trying to say. But it’s more than just Salim-Javed. Yes, it’s their words and their story, but more than that it’s Amitabh. Somehow, in some magical way, in this film he became the embodiment of an entire country of unhappy disenfranchised lost people. Their suffering, their endurance, their pride, and most of all their Anger, at the wealthy, at injustice, at God himself, it was all somehow part of him. And his fight was their fight too, when you saw him onscreen taking on a dozen men by himself, it felt like somehow he was trying to make life better for everyone against the impossible odds that were stacked against them. And when he dies in the end, it’s not “punishment for sins”, it’s martyrdom, so that the future might have hope and life. “In my veins flows not just my father’s blood and my mother’s milk but my brother’s sweat”. I love that line, and it also summarizes what this film is saying about India today. Shashi, the bright clean future of the country, only got to where he is thanks to the sustenance given him by the suffering working women, the blood giving him by the men who sacrificed before. But more than that, and the part that Salim-Javed made this whole movie to remind us, he got there thanks to the labor of the working man, the forgotten abused working man who is forgotten by God and society at the same time that he is fighting the world and sacrificing his life on their behalf. Okay, what does this have to do with Raees? Well, I kind of wonder if there might be a similar message between the lines here. There may not be, the trailers with their songs and action scenes and all that make it look like maybe just a Masala movie. And “Battery nahi bolne ka” isn’t exactly “Mere Paas Ma Hai”. But it is directed by Rahul Dholakia, whose most famous work is Parzania, one of the most radical and dangerous films released in India, taking a painful look at the massacres in Gujurat in 2002 . His follow-up received less critical acclaim, but was equally political, dealing with the situation in Kashmir. So, you have to wonder, is there going to be something else going on under the surface here? One of India’s most famous Muslims (if not The Most Famous Muslim) playing a Muslim onscreen for only the 3rd time in his career (4th if you count Hey Ram, which I don’t), directed by an artist known for taking on communal issues, and set in a state that has had a massive communal upheaval in the past 20 years? Is this going to be another Deewar, a film in which the surface message may be just cops and robbers, but the hidden message is something a lot more radical? This entry was posted in Shahrukh and tagged Amitabh Bachchan, Deewar, Film Reviews, Parzania, Raees, Rahul Dholakia, Salim-Javed, Shahrukh, Shahrukh Khan by mredlich21. Bookmark the permalink.